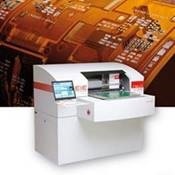 Based on DMD technology, First EIE’s direct image platform also features a high-powered UV light source, which provides a full spectral range from 365nm to 450nm—allowing full compatibility with almost all resists and solder masks. Features include full panel to local panel scaling, resolution down to 1mil lines and spaces, real time Z-axis focus adjustment and as usual with EIE equipment, a very maintenance friendly design. The EDI500 addresses panel sizes up to 24″ x 27″ with a very compact foot print while the EDI700 allows processing panels as large as 30″ x 36″. all4-PCB (North America) Inc. is proud to be representing this product line. Founded in 1998, the Hollister, California manufacturing site has grown to a 50,000 sq ft facility. Success of this rigid board, prototype facility spurred the investment in adding flex and rigid flex capability at the Royal Flex Circuits location in Santa Fe Springs, Southern CA.